In a way, this is a higher level version of the traditional "Introduce yourself to your classmates and to the professor" activity at the start of every class. A student recently asked why there was no formal introduction by coach on the first day of the trimester- this is why. More importantly, this exercise is an immediate and practical application of marketing in the real world to the most important brand in the world for you - the brand with your name on it. So why not use effective marketing principles that we learn in class to promote your personal brand and get higher returns for doing so? Why confine your brand to the classroom when you can get a google result at the top of the google page with your name on it, for free? Why let other people determine what others see on the web about you when you can have relative control over it (as my marketing class will learn later in the course, this is your brand identity- what you say to the world vs. brand image- what the world thinks of you). This is a snapshot of the correct post. Once you make your profile, you have to post the url to our class FB page as a comment on the linked in assignment. 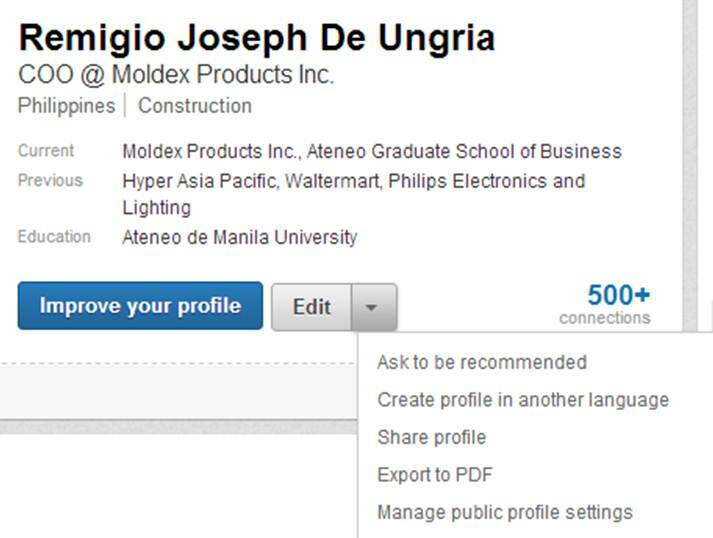 A second requirement is this: While in Linkedin, export the file as a pdf, then email the pdf to rdeungria@ateneo.edu. 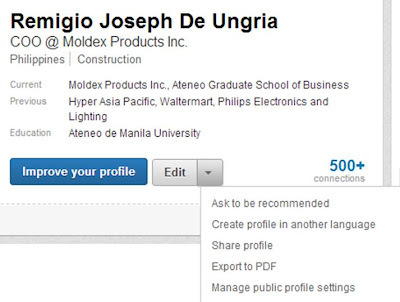 Here is a snapshot of how to export your profile as pdf. Simply click on the down arrow beside "Edit" as shown below. Here's why joining Linked In is a great idea. 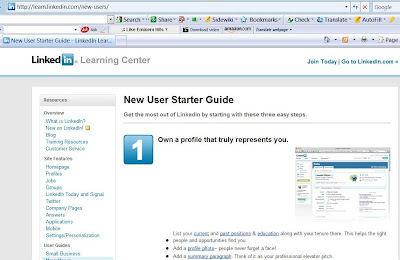 What should be in your linked in profile? Good articles, well presented and informative articles. This is a very useful information.